The sixth Hands-on Agile webinar product owner anti-patterns addresses 12 ways to improve a product owner’s skill set. Learn also when you — as the scrum master or scrum team — should reach out to your product owner and offer support. Note: If the browser will not play the playlist automatically, click here to watch the Webinar Product Owner Anti-Patterns playlist directly on Youtube. 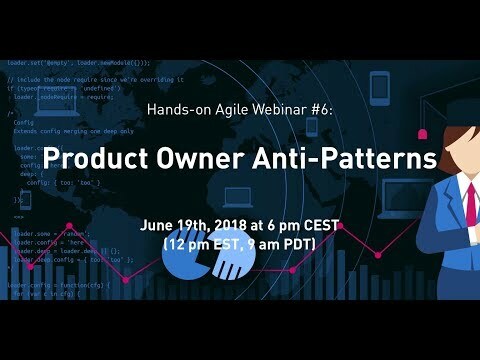 If the slide deck will not work within this browser window, please click here to browse the slide deck of the webinar product owner anti-patterns directly on Slideshare. There, you will also be able to download a PDF of the slide deck.